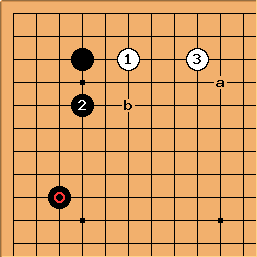 is considered a kakari 'from the wrong direction' because it does not prevent an enclosure. 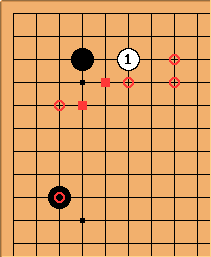 It is in practice only played when there is already a move like on the left side. The most common answers are the squared points, the main alternatives are the circles. accepts the invitation to make an enclosure. 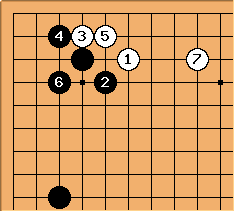 After , the joseki is finished. 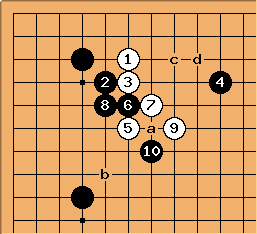 If White already has a stone at or around a, is played at b.
puts more pressure on White. is one possible answer. After that, Black must choose between peace and war. is the peaceful answer, and white creates a living group. 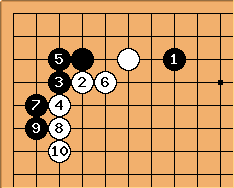 The alternative is at , but my data are insufficient to specify what would be joseki after that. More common is the push up at . There are various possible answers. Here is one follow-up. Other possibilities for are c, d and . A third possibility for White is the extension at . 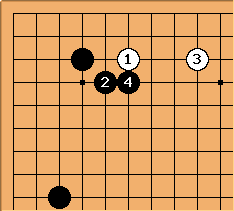 Black can continue with , but White often plays tenuki after this, considering a light stone. When black plays the pincer with , a common variation is shown here. After we are in a position that is more commonly reached through the 3-4 point distant low approach, one-space low pincer joseki.